Baking soda is generally a staple item in most households. You use it for baking cakes and muffins, but did you know you can even clean with baking soda. Besides baking and keeping the odors at bay in your refrigerator, you can use it all around your home in a variety of ways! Create a homemade Goo Remover recipe that is great for removing any sticky messes like stuck on stickers, removing crayon marks, grease and more. Simply mix 1/2 cup olive oil, 1/2 cup baking soda, and 5 drops of orange essential oil into a container. Mix well and use it to apply to sticky messes, let sit for up to five minutes, and wipe away. Simple to make and very effective. Store in container with a lid. Fill your washing machine up to full with hot water. Add 1 cup of baking soda and let your washing machine run, with no clothes inside. When it gets to the rinse cycle, add in 1/2 cup of vinegar. This will help remove any buildup, scum, etc that accumulates over time. You can do this once a month to keep your washer nice and fresh! Cover the bottom of the pan with a layer of baking soda, and then add warm water to create a wet paste. Let this sit for an hour or more, or even overnight. Then wipe out the pot with a wet sponge, and the burnt food will come right off. It if is still stuck, repeat the process but use boiling hot water to pour into the pot, and let it sit and cool, then wipe clean. See the best way to remove stains on bakeware. Clean your sink out and remove any food or debris. Sprinkle baking soda over the entire sink surface and scrub with a wet sponge. Rinse away any residue of the baking soda and dry with a towel. To add shine rub it with olive oil or window cleaner and buff dry with a soft cloth. If you are cleaning an appliance, apply baking soda to a wet sponge and use to wipe down appliance. Then with a soft cloth buff to add shine. Wet your mug with water, then get a damp cloth or sponge and apply baking soda to the area that has the coffee stains inside the mug. Use it to scrub away the stains. If it won’t budge, soak in hot water with some baking soda in the water, and then wash and wipe clean. Check out our recipes for Simple DIY Dishwasher Detergent! Remove any hair from the bristles of your brush or comb. Then create a solution of warm water, a splash of Listerine mouthwash and about a teaspoon of baking soda. Stir this around, and let your brushes and combs sit for 30 minutes. Rinse well with clean water, and let air dry. 1 part blue Dawn dish soap and 2 parts hydrogen peroxide create a wonderful stain remover. Mix into a paste and apply to the affected area on the garment. If it is a stuck stain use a soft bristle toothbrush to massage the mixture over the stain. Let it stand for 15-30 minutes and wash like normal. Air dry to ensure stain is gone, if not repeat the process. Strip the bed of any bedding, and then sprinkle baking soda over your bed. Allow this to sit for a minimum of one hour. Come back and vacuum up the baking soda to help remove any dander and dirt that has accumulated in your bed. Do this once a month. 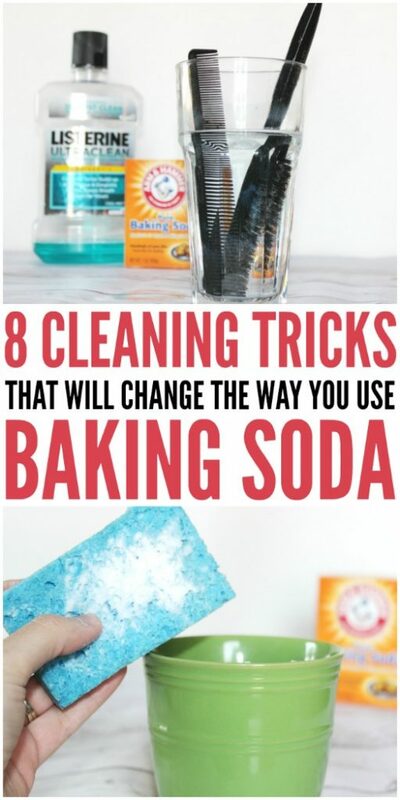 If you are interested in more ways you can use baking soda around your home, check out this article that shares 40 more baking soda uses!